To say the Toyota Camry has been popular is an understatement. The strong-selling midsized sedan is now in its eighth generation of providing efficient and comfortable transportation to millions of happy drivers. 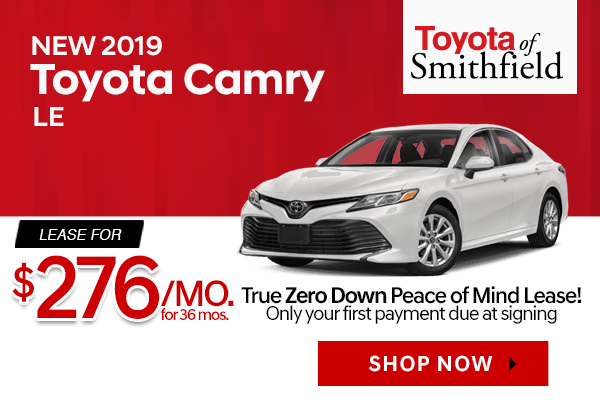 The 2019 Camry offers that same excellent fuel economy combined with interior amenities and impressive standard safety equipment. The Camry is available in seven conventional gas-burning trims: L, LE, XLE, XLE V6, SE, XSE, and XSE V6 (there are also three hybrid Camry trims). The available engines are the 203 hp four-cylinder and the 301 hp V6. Either engine pairs with an eight-speed automatic transmission, with paddle shifters and a multiple-mode (Normal, Sport, and Eco) driving selector available. Read more.